Have you ever wondered, while sitting by yourself, why doesn’t the world adopt a single currency? Well, you are not alone in thinking this. Looking at the insane exchange rates banks impose on money exchange or money transfer abroad, most people think why not abolish different currencies and simply stick to one world currency. Buckle up future Raghuram Rajan, this is why! Let’s take a look at what would happen if the world had one currency by evaluating its pros and cons. When you are exchanging one currency for another, currency exchange fees are always involved. Banks charge this fee for performing the service of exchanging the currency in your hand to another foreign currency you need. This fee is also charged when you want to send foreign currency to your friend or close relative staying abroad. A one world currency will solve this problem. Travel anywhere in the world and you will be able to use the same currency and thus no need to pay exchange fees. Different currencies for different countries and their varying exchange rates are an obstacle to the free flow of trade. When a single world currency is implemented it will boost the volume of trade and transactions between countries. There will be price transparency of importing and exporting goods. When the Economic and Monetary Union of Europe was created in 1992 and the Euro was adopted as the common currency, trade between EU members increased by 8 to 16%! Now that we’ve discussed the pros of a one world currency, the case seems fairly straightforward right?? You might be asking now why we haven’t still done this! Why haven’t we adopted a single currency? That’s because currently, the pros don’t outweigh the cons of one world currency. Establishing a one world currency would mean forming a central bank that has the sole authority to print currencies and set interest rates. Now you can agree that the economic conditions prevailing in each country are different and unique. A central bank must act fair and hence cannot formulate economic policies favouring one region over another. It must formulate a uniform economic policy across the world with the same interest rates everywhere no matter what the economic condition of individual countries is. However, this is not practical when considering all countries at the global level. A single world currency would mean governments would have to give up their autonomy over drafting economic policies benefiting them. This may not turn out so well. Consider the example of China. China is a country whose economic value of exports is greater than its imports. Thus it devalues its currency making its exports attractive abroad. Why are exports attractive after devaluation? Because now the same amount of foreign currency can buy more Chinese currency and thus foreigners would prefer buying the ‘cheaper’ Chinese goods. How does China devalue its currency? By increasing its money supply in the economy. When there is more money flowing into the economy, the value of each individual paper currency decreases leading to its devaluation. China can use two methods of increasing money supply. By printing more currency or by decreasing interest rates. When interest rates are decreased, more people borrow money from banks to spend and there is more overall currency flow in the economy. Thus China can control its policies to maintain its economy. However, if there is a single world currency, then China would not be able to implement these economic policies and in the extreme case, their economy may even collapse! 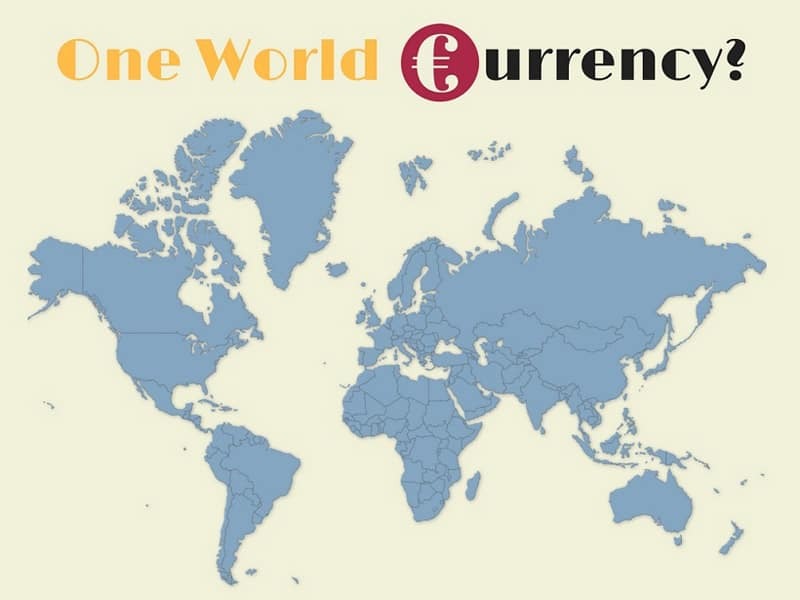 A one world currency may solve the problem of forex trading and currency speculation but it might inadvertently create more problems of its own! We previously talked about the central bank of a one world currency having to act in a fair and unbiased manner. However, even when the central bank tries to act fair, a uniform policy will benefit some countries and may prove disastrous for some others! As an example, you need not look any further than Germany in European Union. Germany is probably the country that benefited the most from the adoption of the euro. Germany was a strong economy even before the formation of the European Union and the German Mark was among the strongest currencies in the world. With the adoption of the euro, a devalued currency compared to the Deutsche Mark, German exports became attractive to the rest of the countries in Europe and the German economy further prospered. Other member states, especially in south-eastern Europe, could not devalue their currency to boost exports and reduce their debt. The euro being the common currency, they could not frame their own monetary policy and become competitive. Thus their exports dwindled and debt soared. Now that you know both the pros and cons of single currency use, you’ll understand why the world isn’t moving forward with this solution. But that doesn’t mean nobody is working towards a practical one world currency solution. Right now cryptocurrencies are offering a glimmer of hope. They are projecting themselves as a fast, cheap and easy mode of monetary transactions that have the potential to replace forex transactions. However, the hope is only a glimmer now and it doesn’t seem like it will materialize anytime soon. The widespread adoption and acceptance of cryptocurrencies by many world governments remain a major problem. Until then, if you want low cost, easy and fast forex transactions, look no further that ExTravelMoney, your perfect partner to help you find the best forex deals in your town or city! Find currency exchange and money transfer abroad at the best rates online in India and save money on forex transactions.